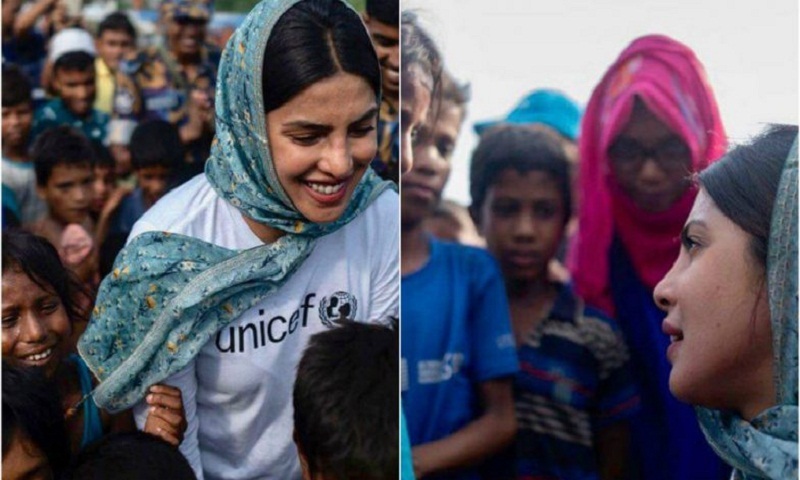 Bollywood actress and Unicef Goodwill Ambassador Priyanka Chopra is scheduled to visit Kutupalong camp in Cox’s Bazar today (Wednesday). Priyanka, from Hariyakhali, went to Leda camp, where she visited a child development centre established by Unicef. She also visited the camp in Unchiprang area, where around 30,000 Rohingya people are currently staying. On Monday, the Bollywood actress, now on a four-day visit (May 21-24), has sought support for Rohingya children saying these kids are their future and the world needs to care about them. Hours after her arrival in Dhaka on May 21, she left for Cox’s Bazar by a private airlines flight. She will fly to Dhaka on Thursday. After spending two days in Cox’s Bazar, Priyanka, who was named a global Unicef Goodwill Ambassador, after serving as a National Goodwill Ambassador to India for 10 years, is scheduled to return to Dhaka on Thursday and leave Dhaka in the evening on the same day. The actress has flown to Dhaka from London, where she attended her friend and actress Meghan Markle's wedding to British Royal Prince Harry.